Head to Rivenspire on the order of High King Emeric and assess the situation between the noble houses. 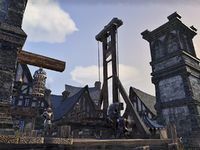 A bloody conflict has erupted between the noble houses of Rivenspire and High King Emeric has asked me to go there on his authority and attempt to restore order. Talk to Darien Gautier at Oldgate. This page was last modified on 15 November 2018, at 22:57.